This week’s entry is probably the most well-known Black superheroine, Storm. Introduced in “Giant Size X-Men” #1 in 1975, Storm (real name: Ororo Munroe) has since become one of the most popular members of the team. Storm was created by Len Wein and David Cockrum. 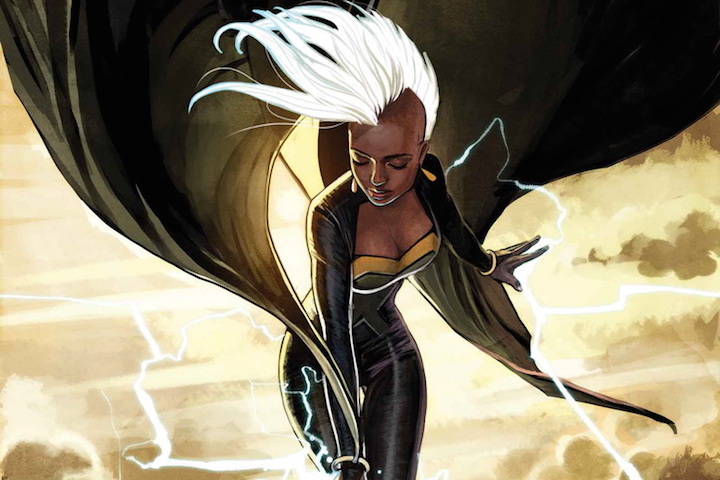 As her name implies, Storm’s mutant superpower is the ability to control various weather elements. Ororo’s backstory states she was born in New York City to an African tribal princess and an American photojournalist. After her parents were killed during the now-improbable-sounding (per comic book time) Suez Crisis of the 1950s, Ororo became an orphan, who eventually took up thievery under a Cairo gang lord’s training. After parting ways from this life, Ororo eventually wound up in the Serengeti, where her powers first emerged. For awhile, an African tribe worshipped Storm as a goddess. Eventually, Charles Xavier recruited Ororo to join the X-Men. Since that time, Storm’s become one of the team’s most prominent members. She’s even lead the team on various occasions. Storm’s knowledge of thievery (lock-picking, etc.) augment her usual powers. Ororo also has strong tactical/leadership skills, plus excellent hand-to-hand combat and weaponry skills. Traditionally, she’s had one weakness: claustrophobia (tied to her parents’ deaths). Recently in the comics, Ororo married fellow African superhero Black Panther (the first Black superhero in mainstream American comics), thus becoming the queen of the fictional African country Wakanda, which Black Panther (real name T’Challa) rules over as its king. The wedding took place in 2006’s “Black Panther” #18, and got some outside media attention. “TV Guide” featured a wedding dress for Storm designed by the costume designer for now-canceled long-running soap opera “The Guiding Light.” However, the marriage has since has been annulled. Storm’s a mainstay in non-comics X-Men appearances. The 90s “X-Men” animated series and the 2000s/2010s live-action films are her two most prominent media appearances. Two actresses voiced Storm in the 90s series, Iona Morris and Alison Sealy-Smith.